Read Robin M. Jensen’s article “Witnessing the Divine” as it originally appeared in Bible Review, December 2001.—Ed. 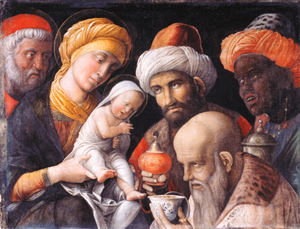 Joseph, Mary and the three magi gaze at the newborn babe in Italian artist Andrea Mantegna’s “Adoration of the Magi” (c. 1500). The magi proffer precious gifts: a fine Chinese porcelain bowl filled with gold coins; a censer (for frankincense) made of Turkish tambac ware (an alloy of copper); and a green agate vessel, presumably filled with myrrh. Photo: Collection of The J. Paul Getty Museum. The magi lend an exotic and mysterious air to the Christmas story. The sweet domesticity of mother and child and the bucolic atmosphere of shepherds and stable are disturbed by the arrival of these strangers from the East. The background music changes from major to minor. Sentiment gives way to awe, perhaps even fear. Nevertheless, or perhaps because of this, the legend of the magi has fired the imagination of Christians since the earliest times. In art, the adoration of the magi appeared earlier and far more frequently than any other scene of Jesus’ birth and infancy, including images of the babe in a manger. The artistic evidence suggests that the early church attributed great theological importance to the story of Jesus’ first visitors—an importance not overtly stated in this enigmatic gospel account of omens and dreams, astrological signs and precious gifts, fear and flight. To understand how the earliest Christians interpreted the message of the magi, we must look to early Christian literature (theological treatises, sermons and poetry)—and art. So opens the second chapter of the Gospel of Matthew, the only biblical account of this nocturnal visit. In vivid contrast to Luke’s gospel,a Matthew omits any mention of Mary and Joseph’s trip to Bethlehem to be registered, a crowded inn, a sheltering manger, or watching shepherds startled by an angel’s announcement of the messiah’s birth. Instead, the first gospel focuses on the journey of these eastern emissaries, who see an unusual star rising, interpret it as an omen that they should investigate, and follow its path first to King Herod of Judea and then to Bethlehem, where it appears to stop above a house in which a child had recently been born. Entering the house, the men pay homage to the babe and offer him gifts: gold, frankincense and myrrh. Then they leave, having been warned in a dream not to return to Herod, who has hatched an evil plot that will lead to the slaughter of innocent children, the weeping of their mothers. Three shadowy figures (shown here, compare with photo of the Catacomb of Priscilla) approach the Virgin and child, seated at right. Dating to the mid-third century C.E., this fresco from the Catacomb of Priscilla is the earliest known image of the magi, which later became the most common scene of Jesus’ birth and childhood in early Christian art. Photo: Scala/Art Resource. As shown in this photo, the painting appears above an arch in the oldest section of the catacomb, the Capella Graeca, which is lined with benches—perhaps for ancient funerary meals. Photo: Scala/Art Resource, NY. The earliest extant portrayal (see photo of fresco from the Catacomb of Priscilla) of the magi, dated to the mid-third century, appears above an arch in the Catacomb of Priscilla, in Rome.1 As in almost all the early images of the magi, they are shown as three men, identical in size, dress (although the color of their clothing varies in the catacomb painting) and race. Each carries a gift. It is difficult to discern the presents in the faded catacomb painting, but usually in art one of them carries a wreath and the others a bowl, jug or box-shaped object. The magi advance in a line toward the child seated on his mother’s lap. In many early images, they appear to point or gaze at a star overhead. Sometimes their camels appear behind them, as in a fourth-century sarcophagus relief in the Vatican Museums (see photo of fourth-century sarcophagus). The early images almost always appear in funerary settings—on catacomb walls and sarcophagi. The magi scene is among the first narrative images to appear in Christian art, and predates most other New Testament scenes as well as any other representation of Jesus’ nativity (a unique fresco [not shown] of Balaam and the Virgin with child in the Catacomb of Priscilla may be the exception). The complex composition and emphasis on narrative detail provide further evidence of the import the story held. Angels flank the enthroned Mary and Jesus in this sixth-century mosaic from Sant’Apollinare Nuovo in Ravenna, Italy. The magi, followed by wreath-carrying female martyrs, press toward them. The names of the magi do not appear in the New Testament, nor does the number. The Gospel of Matthew speaks simply of “magi from the East.” By the second century, they were identified as three; by the fifth, they were identified as kings and, in the West, given the names Balthassar, Melchior and Gaspar, which appear above the magi (perhaps as a late addition) in this mosaic. Here, Balthassar is shown with a long brown beard. Melchior is a clean-shaven youth. Gaspar has long gray hair; over time, he would become the balding man who kneels before the babe in countless Renaissance images. Photo: Scala/Art Resource, NY. By the fifth century, Christian art had spread from catacombs and sarcophagi to vast public spaces, and the magi began to appear in the mosaic decorations of the first great basilicas. These mosaics share the same basic composition seen in earlier funerary art. In a sixth-century mosaic from the church of Sant’Apollinare Nuovo, in Ravenna, Italy, for example, the magi appear as extravagantly dressed triplets, bearing their gifts in fluted vessels as they press forward, gazing up at the star.b Before them, the baby Jesus is seated on Mary’s lap, flanked by angels. The magi of the Ravenna mosaic may be distinguished only by their hair (one has long brown hair and a beard; one is a clean-shaven youth; the third is an elderly man, his hair greying) and their names (most likely a later addition), which are inscribed above them: Balthassar, Melchior and Gaspar (often spelled Caspar). The names and nationalities of the magi also varied throughout the world, especially in the East.4 An Armenian infancy gospelc from about 500 lists them as Melkon, King of Persia; Gaspar, King of India; and Baldassar, King of Arabia—and is thus closest to the Melchior, Caspar (or Gaspar) and Balthassar of the medieval Latin church. 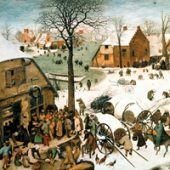 Explore the date of Christmas in Andrew McGowan’s popular Bible Review article “How December 25 Became Christmas,” available for free in Bible History Daily. The early church fathers interpreted the magi story in light of Old Testament prophecy. Christians understood the Greek translation of the Hebrew scriptures (the Septuagint) to be a sacred text that contained types and figures pointing to the coming of Jesus as Messiah. The fresco shown here depicts the three youths who refused to worship an idol in the Persian court (Daniel 3). They were thrown into a fiery furnace, where they were saved only by invoking the name of the Israelite God. In this painting, a Persian official stands to their right, pointing at the idol, which is shown as an imperial bust. Photo: Pontificia Commissione di Archeologia Sacra. In this fresco, the three magi appear almost identical to the three youths. These fourth-century paintings appear together in the Catacomb of Marcus and Marcellianus in Rome. According to the second-century church father Justin Martyr, the magi were pagan sorcerers and astrologers from the East. When they saw the babe, they renounced their pagan ways. Like the three youths, they recognized the true God and refused to commit idolatry. Photo: Pontificia Commissione di Archeologia Sacra. The parallel between the three youths and the three magi is made sharper in a fourth-century sarcophagus relief from St. Gilles, in Arles, France. Here, three eastern men turn away from a Persian official standing beside an idol and point toward the Star of Bethlehem. Photo: Sarcophages Chretiens de la Gaule. The magi’s special role as witnesses to the true faith was also noted by the church father Origen, who read the magi’s stories in light of the prophecies of Balaam. According to Origen, after the star appeared to the magi, they noticed that their magic spells faltered and their power was sapped. Consulting their books, they discovered the prophecy of the oracle-reader Balaam, who saw a rising star “com[ing] out of Jacob” (Numbers 24:17) that indicated the advent of a great ruler of Israel. The magi thus conjectured that this ruler had entered the world. So, the magi traveled to Judea to find this ruler, and based on their reading of Balaam’s prophecy, the appearance of the comet and their loss of strength, they determined that he must be superior to any ordinary human—that his nature must be both human and divine.11 The magi, for Origen, are not simply Jesus’ first visitors, but the first to recognize Jesus as messiah. By the third century, biblical interpreters were finding echoes of Psalm 72 in the narrative of the three gift-bearing visitors: “May the kings of Tarshish and of the isles render him tribute, may the kings of Sheba and Seba bring gifts! May all kings fall down before him, may all nations serve him” (Psalm 72:10–11). The magi were identified as these kings of “all nations” who worshiped the Christian messiah, bowing down to give him homage. They became a potent sign that Christ’s salvation was predicted and open to the whole world. The rising of the new star marked the coming of the new age envisioned in the Old Testament. “Severa—may you live in God” reads the inscription on this fourth-century funerary plaque from the Catacomb of Priscilla, in Rome. Severa appears at left; at right is the familiar magi scene, with an unusual addition: A man standing behind Mary points out the star. Although some believe that this is Joseph, others think it is the prophet Balaam, who predicted that a rising star coming out of Jacob would herald a great ruler of Israel (Numbers 24:17). Photo: Scala/Art Resource, NY. The passage from Psalms cemented the magi’s identification as kings and led to a fresh understanding of their origins.13 The earliest writers had understood the magi to come from one region (usually identified as Persia).14 But in the eighth century, the Anglo-Saxon historian and theologian known as the Venerable Bede recorded a later tradition that the three magi signified the three parts of the world—Africa, Asia and Europe—and that they thus might be linked with the sons of Noah, who fathered the three races of Earth (Genesis 10). Is it possible to identify the first-century man named Jesus behind the many stories and traditions about him that developed over 2,000 years in the Gospels and church teachings? Explore articles on Jesus in Bible History Daily. This 15th-century Nativity scene includes the Trinity: God the Father appears at top, surrounded by a host of cherubim; the Holy Spirit in the form of a dove descends on golden rays; and the Son is cradled in the wings of angels. Early Christian writers noted that the magi were the first witnesses to the Trinity. Their affiliation with the Trinity, suggests author Robin Jensen, might explain why they are almost always depicted as three. This illumination appears in the prayerbook Les Très Riches Heures, produced by the Limbourg Brothers for the French Duke of Berry. It is now in the Musée Condé, in Chantilly, France. Photo: Giraudon/Art Resource, NY. What may be the most impressive and influential understanding of the magi weaves together many of the interpretations expressed by the church fathers: that the magi were the world’s first witnesses to the Trinity. This explains their appearance in almost all artistic images and literary traditions as three men, different, but alike. The fourth and fifth centuries (when many of the images of the magi shown here were made) were a time of great theological debate—first over the relationships of the three persons of the Trinity, and subsequently about the human and divine natures of Jesus Christ. As the first visitors to recognize who this newborn child was, and what his birth would mean to the whole world, the witness of the magi was not insignificant to these controversies. Their three gifts seemed to demonstrate their prescient understanding of the three distinct persons who shared a single “nature” within the Trinity, as well as the different roles of the two separate but inseparable natures in the single person—the incarnate Jesus. Centuries later, artists would depict what the magi were believed to have witnessed—the Trinity made manifest at the Nativity. The birth scene in the early-15th-century manuscript known as Les très riches heures du Duc de Berry, illuminated by the Limbourg brothers, includes God the Father in a cloud; the Spirit in the form of a descending dove; and the Son, the newborn babe lying on a bed of hay (see photo of early-15th-century Nativity scene). The promise of salvation is represented by paired scenes of Jesus raising the dead (left) and the magi approaching the babe (right) on this fourth-century sarcophagus, from the Vatican’s Museo Pio Cristiano. As the first to recognize Jesus as messiah, the magi, according to the early church, were also the first to recognize the promise of eternal life through resurrection. This hopeful message of the magi accounts for their frequent appearance in funerary settings. Photo: Courtesy of Robin M. Jensen. Gifted with power to divine oracles and read stars, the magi recognized the child as the messiah, as both human and divine, king and child, intimately present and cosmically meaningful, mortal and eternal. For the early church, the magi themselves came to represent the Trinity. A final image of the magi, paired on a fourth-century marble sarcophagus with a scene of Jesus raising the dead (see photo, above), reinforces why their image appears so early and so frequently in funerary settings. In recognizing the promise of a messiah who was both human and divine—and eternal—the magi provided a message of hope for both the living and the dead. “Witnessing the Divine” by Robin M. Jensen originally appeared in Bible Review, December 2001. The article was first republished in Bible History Daily in December 2012. Robin M. Jensen is the Luce Chancellor’s Professor of the History of Christian Art and Worship at Vanderbilt University. Her books include Baptismal Imagery in Early Christianity (Baker Academic, 2012) and Understanding Early Christian Art (Routledge, 2000). a. On the variations in the gospel accounts of the Nativity, see “Where Was Jesus Born?” Bible Review, February 2000, a debate between Steve Mason and Jerome Murphy-O’Connor. b. For more on the mosaics of Sant’Apollinare Nuovo, see Dennis Groh, “The Arian Controversy: How It Divided Early Christianity,” Bible Review, February 1994.
c. An infancy gospel is an apocryphal (noncanonical) gospel that recounts stories about Jesus’ and Mary’s parents as well as about Jesus’ birth and childhood. d. See Ronald Hock (article) and David Cartlidge (captions), “The Favored One,” Bible Review, June 2001. 1. The painting appears in the catacomb’s Capella Graeca. A short, general discussion of the art is found in Neil MacGregor, Seeing Salvation: Images of Christ in Art (New Haven, CT: Yale Univ. Press, 2000); and an older and finely detailed collection was done by Henri Leclercq, “Mages,” in the Dictionnaire d’archéologie chrétienne et de liturgie 10.1 (1920), pp. 980–1070. 2. On the development of the feast of Epiphany (which means “appearance” or “manifestation”), and the relative place of the Nativity, the baptism of Jesus, the miracle at Cana and the arrival of the magi as celebrated on this day, see Thomas Talley, The Origins of the Liturgical Year (New York: Pueblo, 1986), pp. 144–147, in which Talley shows that the development of January 6 as a celebration of the visit of the magi emerges when the date of the Feast of the Nativity is firmly established as December 25 (rather than January 6), and generally should be dated no earlier than the late fourth century. The Latin-speaking West shows this development earlier than the Greek or Syriac-speaking East, as shown by Augustine’s sermons and Prudentius’s hymn written for the feast of the Epiphany. See Augustine, Sermons 199, 200, 201, 202, 203 and 204; Prudentius, Hymn 12. The determination of the 12 days between Jesus’ birth and the magi’s arrival in Bethlehem was most likely due to the reconciliation of the two different dates for Christmas in the first centuries (December 25 and January 6). Still, not everyone agreed, and different calculations remained. For instance, see Epiphanius of Salamis, Panarion 51.22.17, who not only argues that the magi took two years to arrive, but that they arrived on what he claimed to be the “very day of Epiphany”—the eighth day before the Ides of January, or 13 days after the increase of daylight (probably January 6 or 7, depending on which calendar he was using). 3. The unidentified author (Pseudo John Chrysostom) of the fifth- or sixth-century Opus Imperfectum in Matthaeum, Homily 2.2 (Patrologia Graeca 56:637–638) gives this number, probably on the basis of an apocryphal gospel attributed to Seth. This Syrian tradition had a parallel in parts of the Armenian Church. Also see the seventh- or eighth-century Chronicle of Zuqnin in which 12 magi are described as seeing different faces in the star, each a different age. Leo’s enumeration appears in Sermon 31.1, 36.1. 4. The eastern literature (Syriac, Coptic, Ethiopic, Armenian, Georgian and Persian) contained the greatest variety in names. The first documented appearance of the names in the West seems to be in the Excerpta latin barbari, ed. Theodore Mommsen, Monumenta Germaniae Historica: AA 9, Chronica minora 1 (Berlin, 1892), p. 278 (cited by R. McNally, “The Three Holy Kings in Early Irish Writing,” in Kyriakon: Festschrift Johannes Quasten, ed. Patrick Granfield and Josef Jungmann, [Münster/Westfalen, 1970], vol. 2, p. 670, n. 14). A detailed study of the names of the magi is by Bruce Metzger, “Names for the Nameless in the New Testament: A Study in the Growth of Christian Tradition,” Kyriakon, vol. 1, pp. 79–85. See also Hugo Kehrer, Die Heiligen Drei Könige in Literatur und Kunst, 2 vols. (Leipzig, 1908–1909; reprint: Hildesheim, 1976), vol. 1., p. 68ff; and A. Bludau, “Namen der Namenlosen in den Evangelien,” Theologie und Glaube 21 (1928), p. 275ff. 5. Richard C. Trexler, The Journey of the Magi: Meanings in History of a Christian Story (Princeton, NJ: Princeton Univ. Press), pp. 44–52. In 1903 the cardinal of Cologne sent some of the relics back to Milan. 6. Protevangelium James 21.1–3, in New Testament Apocrypha, vol. 1, ed. Edgar Hennecke and Wilhelm Schneemelcher (Philadelphia: Westminster, 1963), p. 386. 7. Justin, Dialogue with Trypho 77.4, 78.1. Although it might seem a stretch to the modern reader, Justin identifies Herod with the king of Assyria. 8. Tertullian, On Idolatry 9. This reading is repeated in the sixth century in a sermon of Caesarius of Arles, who (in his Sermon on the Epiphany, 194) describes the journey of the magi as a spiritual pilgrimage of conversion. See also Tertullian, Adversus Marcion 3.13. 9. Their outfits are also the standard costume worn by the popular mystery gods Orpheus and Mithras in late antiquity. Concerning their dress, see Thomas Mathews, The Clash of Gods: A Reinterpretation of Early Christian Art (Princeton, NJ: Princeton Univ. Press, 1993), p. 84. Here Mathews also makes this point about Orpheus. Mathews also cites Franz Cumont’s analysis of their dress as replicating that of captive barbarians. See Cumont, “L’adoration des Mages et l’art triumphal de Rome,” Memorie della Pontificia Accademia Roma di Archeologia 3 (1932–1933), pp. 81–105. On Orpheus’s role in Christian art, see Robin Jensen, Understanding Early Christian Art (London and New York: Routledge, 2000); and M. Charles Murray, Rebirth and Afterlife: A Study of the Transmutation of Some Pagan Images in Early Christian Art (Oxford: BAR, 1981), pp. 37–63. On the comparison with Mithras, see Leroy A. Campbell, Mithraic Iconography and Ideology (Leiden: Brill, 1968). 10. Mathews (Clash, pp. 79–81) makes this point and argues against earlier analyses that the parallelism between the two sets of three orientally dressed characters was simply a case of mistaken identity. We also might recall that the three youths in the furnace were not alone. From a traditional Christian perspective, the fourth figure who appeared “like a God” (Daniel 3:25) was a precursor of Christ. 11. Origen, Contra Celsus 1.49–50. Also see Origen’s Homilies on Numbers 13.7, 15.4 on Balaam; as well as his commentary On Genesis 14.3 (in which he sees Abimelech, Ochozath and Philcol as prefiguring the magi). 12. On the story of Balaam as background to the Gospel Matthew, see Raymond E. Brown, The Birth of the Messiah (Garden City, NY: Doubleday, 1977), pp. 190–196. Also see Jerome’s Commentary on the Gospel of Matthew 1.2. 13. Tertullian, for instance, in his treatise Adversus Marcion 3.13, reads Psalm 72 in this way, and understands the magi “as like kings” (fere reges). On their royal status, see also Caesarius of Arles. 14. Prudentius, for example, speaks of the magi as Persian. See Clement of Alexandria, Stromata 1.15; and John Chrysostom, Homilies on Matthew 6.2. 15. See a discussion of this in The Image of the Black in Western Art, ed. Jean Vercoutter, Jean Leclant, Frank M. Snowden and Jehan Desanges (New York: Morrow, 1976), vols. 2 and 3. 16. Some art historians have claimed that the magi are supposed to look like defeated and tribute-bearing barbarians, offering their homage to an earthly ruler. See Cumont, “L’adoration des Mages et l’art triumphal de Rome,” pp. 81–105; and André Grabar, Christian Iconography: A Study of its Origins (Princeton, NJ: Princeton Univ. Press, 1968), pp. 44–45. This interpretation is often applied to the mosaics from Santa Maria Maggiore in Rome (c. 430) and Sant’Apollinare Nuovo in Ravenna, where Jesus and Mary are seated on a throne. However, as Mathews argues in Clash of Gods, one may argue that the image of Jesus enthroned suggests the transcendence of imperial power rather than the ratification of it. 17. Irenaeus, Adversus omnes Haerses 3.9. In the fifth century, Leo the Great repeats this interpretation in Sermon 33, 34, 36 where he speaks of the One Person with a “three-fold function”: God, mortal human, and king. Compare Fulgentius of Ruspe (a North African writer, c. 467–533), Letter to Ferrandus 20. 18. Leo, Sermon 34.4 (my paraphrase). I have discovered that Otto Georg Von Simson made this same connection in Sacred Fortress: Byzantine Art and Statecraft in Ravenna (Chicago: Univ. of Chicago Press, 1948; reprint Princeton: Princeton Univ. Press, 1987), p. 89. So the circumstantial evidence is strong that the maʹgoi who visited the infant Jesus were astrologers. Thus The New Testament translated by C. B. Williams reads “star-gazers,” with a footnote in explanation: “This is, students of stars in relation to events on earth.” Fittingly, then, modern English translations read “astrologers” at Matthew 2:1.—AT, NE, NW, Ph. To stir the pot even more. Well, best would be to ask Zarathusti priests if any connection exists between Persian belief in birth of Saoyshant and Christmas, but I do not of any. There is a tradition in Persia, that the Magis came from the city of Kashan, but just like Christmas date, it is a symbolic tradition. How did the astrologers find Jesus?— They were led by a “star,” not to Bethlehem, but first to King Herod in Jerusalem. The Bible says that Herod wanted to find Jesus to kill him. Now think about this. Who do you think made what appeared to be a star guide the astrologers to Herod?— It was not the true God, Jehovah, but his adversary, or enemy, Satan the Devil! Today, Satan tries to make people think of Jesus only as a helpless baby. But the angel Gabriel told Mary: “He will rule as king . . . , and there will be no end of his kingdom.” Now Jesus is ruling as King in heaven, and he will soon destroy all of God’s enemies. That is what we should remember about Jesus, and we need to tell it to others. It’s a strange thing that the home of the longest surviving Zoroastrian flame is in modern day Iran! Zoroastrian priests are very particular in recording the date of establishment of eternal flames and also it should be stressed when a flame is extinguished. There is good reason to believe that the ‘Fire of Warharan’ was established 2346 years ago! Imagen those ancient hands kindling a fire at the time of Alexander the Great and that it has survived this great passage through time and history. Perhaps even the Magi stood before this very flame or other flames kindled from it! It fill’s me with awe!!! Artists deserve to make a living, so set your prices and maintain a standard. to be with him for love and respect. I’ve heard that Zoroastrianism bit before, but wouldn’t that link the Magi to the prophet Daniel of the Old Testament through Babylon and Persia? The Zoroastrianism belief in one god may have been because of Daniel’s influence as ‘head magi’. This is a great example of many in the scriptures, and gentile history, witnessing to how the ever morphing “traditions of men” often bury the never changing truth of God. Man’s quest for righteousness thru his own efforts/works to know/judge good and evil, rather than thru faith in God first, leads to the mixed fruit of good and evil and then death. The Three Wise Men or Magis were just following the teachings of Zoroastrianism. Because what they believe is that Ahura Mazda, the good god of light, was going to send a messiah born during the darkest days of winter. This messiah would be conceived by a virgin, after she bathed in a lake. This goes back to Yalda, or the Persian winter solstice. This is really wonderful having the articles from BAS on the computer!! It’s so much easier for me to read and actually understand more clearly the wonder of belief! Thank you!